Angels have been asking for an English winemaker - and we think weve found the best of the bunch! Ian Kellett is an English winemaker making sparkling wine on top flight Hampshire chalk. As a former biochemist and top food analyst, Ian is passionate about making wines with as little human intervention as possible, letting Mother Nature do the hard work. His Classic Cuvee has already received critical acclaim, beating champagnes from the likes of Pol Roger and Veuve Clicquot in a blind tasting. "I was born and bred in Yorkshire, God's Own County. My first/undergraduate degree was in Biochemistry from University of London. Then I qualified as an accountant whilst working for a food company. As soon as I qualified as an accountant I got out of it, which all good accountants try to - nobody grows up wanting to be an accountant....I moved into General Management, producing puff pastry products for M&S - what I don't about base bake penetration and laminating pastry fats isn't worth knowing. I used to make 60,000 sausage rolls an hour - eat your heart out Mary Berry, and they were good too. Then some swine offered me a job in the City that the headhunter (worse than lawyers really) told me I could not refuse. I had not the faintest idea what the job was. I was quite happy making my sausage rolls and salmon en croute for M&S and someone calls me up out of the blue and ask me to go and be an equity research analyst. A what? But the headhunter assured me I would regret it for the rest of my life if I didn't take the job. So I started getting up at 04.30 every day for 15 years and commuting to London. Headhunter never mentioned that bit. Eventually I became Managing Director of a top ten investment bank in London, and at various times I was rated as the no.1 food/drink analyst in Europe in various surveys. Me and Lionel Messi, both No.1 at our jobs, but his was more fun in many ways no doubt. After 12 years of that I stopped advising pension funds on shares and started advising smaller food and drink companies themselves, on which other companies they should buy (mergers and acquisitions, all specialised in the food and drink business). Then I set up my own small firm to give advice to large investors, big private equity companies and so forth, on which companies to buy, and how to run them. The wide range of food and drink focused industry and investment experience has been fundamental to my doing what I do now. Years of analysing these companies enabled me to see which type of business might be best for me to run myself, and to invest in. Biochemistry allows me to understand the chemistry of wine making, but what I have really found is that it helps me to realise how little we know scientifically about what is really happening in the wine making process, so it is still artisanal. I bought a house in France in 1996, just North of Bordeaux. All around the house were vineyards, and I spent many Easter and summer holidays looking at the vineyards, watching the vigneron working. Also, I took the little ferry from Blaye over to Pauillac many many times to visit the worlds greatest Cabernet Sauvignon vineyards, to taste and to learn. Soon I was looking at all this with a different eye. Thinking I might buy a vineyard, and I slowly started my research. Then Hambledon Vineyard, in the village where I lived in Hampshire, became available for sale. How much more fun, exciting and challenging I thought to develop an English vineyard to take on the French, especially the might and power of Champagne, than to be another City man who bought some vines in Bordeaux. I never really expected it to take over my life the way it has. I bought my first already planted vines in 1999 when I bought Hambledon Vineyard, but they were the wrong varieties. I planted my own first vines in 2005, Chardonnay, Pinot Noir and Pinot Meunier, to make fizz specifically. I picked my first grapes from my first vines in 2007. I built my first winery, and pressed my own grapes myself for the first time in 2011. I sold my first bottle of English fizz in 2013. Why do I love my job now? Virginity perennially renewed. Every time new and a first. Never the same again, never repeated. What do I mean by that? Grapes are amazing fruit. They can make aldehydes and a range of other chemicals that can make just Chardonnay grapes taste of everything from bananas and pineapples, to lemons and limes, and to err, grapes. And that's just the grape juice. The long list of tail chemicals in the must is enormous. So the wine world never bothers chemically analysing them all because there are so many our ability to know which combination of those tail chemicals, stimulates a certain combination of olfactory nerve filaments (in the nose) to stimulate the right brain cells to go Yippee, is frankly non-existent. That is to say we do not know enough about our own biology/chemistry to be able to make absolute sense of the chemical information from a detailed chemistry test of the juice, even if we did it. So my biochemistry has given me enough to knowledge to realise how little we actually know. So winemaking remains alchemy. And that's what is marvellous about it. And that's just the grape juice. By the time a billion yeast cells, each very slightly different, in a slightly different environment in a tank have wrought their own changes on the must, and then the malolactic baceteria have had their turn, and yet more millions of yeast cells and a little sugar, added to the bottles for second fermentation; each and every bottle in making fizz is essentially a mini wine tank in its own right, and we HAVE to sell the wine in the bottle it was 2nd fermented in. So frankly, each and every bottle is marginally different, multiplied by each and every consumer's own different biology, and the places times and temperatures they are tasted at. So our work is always different. Add to this the where, when and why my wine is drunk. By a man and woman on a first date in a bar, by families at their most special occasions, at parties signalling the passage of one year to the next, at Christmas and at birthdays. My work is present and participates and is sometimes even central to more marriages, birthdays, Christmases and even conceptions than I could possibly manage myself in even a hundred lifetimes. What a glorious amount of fun to be the middle of. So that is what I mean by virginity perennially renewed. Every time different and every time new. This is our work as winemakers, and for the right wines, the joy it brings and participates in, the human joy and pleasure, is immense. What do I think makes our wines special? Our ENGLISH chalk and our ENGLISH climate, will in my view become the world’s leading growing region for high quality, precise, accurate, specific, chardonnay to make the world’s leading Blanc de Blanc fizz. Our 100% gravity fed winery means we are employing a system of winemaking that is unique in England. Add to that our reserve wine processes and our oak management processes, and our highly in depth artisanal blending process with some of the most experienced blenders on the planet, and our wines have the ability to become among the world's best sparkling wines. It will take years of hard work and learning, but with determination we will get there. It hasn’t all been smooth sailing. We have been very nearly bankrupted twice. We have spent more than every penny we ever had to build the winery. When we planted major vineyard expansion in 2011 our pepiniere told us they had sold out of Chardonnay vines of the clones and rootstocks we needed. Completely out. They had to re-juggle all of their deliveries in order to find us what we needed. I got divorced after replanting our first vineyard, which depleted a lot of capital. Winemaking can be very tough on marriages. However, I then met a far far nicer woman and we have now been together 9 years. Anna has lived every step of the journey with me; fundraising, planting, building winery; she has harvested the first 4 years with me. Indeed it was Anna who told the pepinieres that it was not acceptable and they needed to rejuggle all orders with all their customers. Thanks to Naked Angels helping to restore some financial security, the wonderful woman is now at last going to make an honest man out of me. 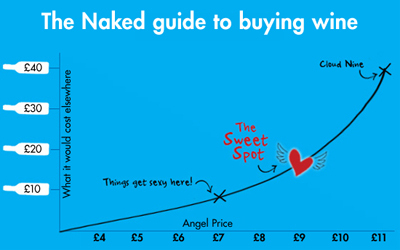 I am getting married on June 4th and Naked Angels have definitely played a part in that. I would say my most memorable winemaking moment (to date!) was when we won an important blind tasting for the first wine we ever made against 8 top brand champagne houses and 3 other English sparkling wines. Praise indeed! Naked Angels funding will help very meaningfully with two projects we have planned. We have to build a new wine cellar (much deeper and larger) to store increasing numbers of bottles sur lattes (ie in 2nd fermentation) and we have to increase winery tank capacity to store more reserve wines and to ferment more wines. We are so grateful for your support with these projects, and we can’t wait to share the resulting wines with you all. On a personal level it will also mean I can now be paid a small salary from the business and so I have been able to buy an engagement ring and get married. Thank you Angels for enabling us to both carry on with our mission, and to be happier whilst we do it. Wine making is an expensive business. Making good wine costs even more. Starting from scratch without inheriting vineyards and wineries makes English fizz a very heavy investment. Naked Angels have been helping winemakers across the world make good wines for some years now, and to be selected by Naked Wines to be an ENGLISH winemaker receiving that help is a wonderful moment for us."